We know not everyone can make it to Anaheim for BlizzCon, but thanks to a fusion of protoss warp technology, dimension-ripping goblin engineering, and cutting-edge Vishkar teleportation techniques, you can join the fun no matter where you are in the universe—introducing the BlizzCon 2016 Virtual Ticket! The BlizzCon Virtual Ticket is your personal online and mobile portal to this year’s show, taking place Friday, November 4 and Saturday, November 5—and it’s available to order now for 29,99 € (24,99 £). The Virtual Ticket grants you access to two online channels of live-streaming HD coverage on both days of the show, and features all of the developer panels on the main and panel stages, exclusive in-depth interviews, the epic closing ceremony, the community contests on Friday evening, and more. You’ll also be able to watch on-demand replays for at least three weeks after the show. Once again, Virtual Ticket buyers also have the option to snag their own BlizzCon 2016 Goody Bag—only this year, it’s a Goody Bag in a Box—featuring an assortment of items to commemorate the occasion. Inside this crate full of collectibles, you’ll find limited-edition stein to raise in celebration of our 10th BlizzCon together, along with a treasure trove of real-world loot based on your favorite Blizzard games. 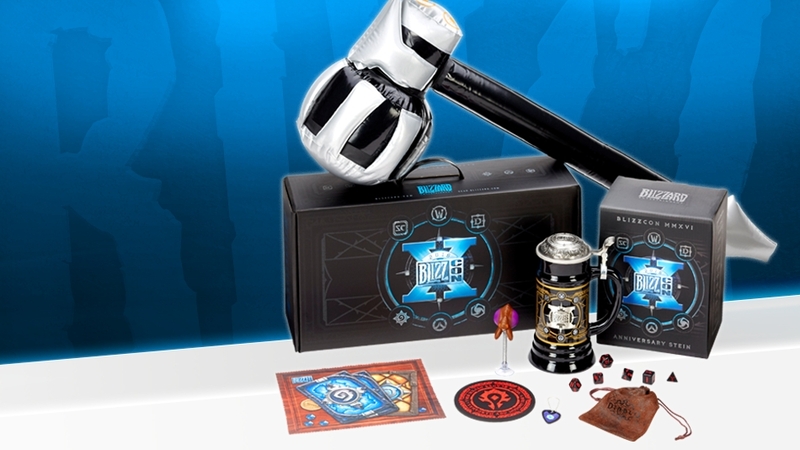 This box of goodies is available to pre-purchase now through the Blizzard Gear Store for an additional $35 USD (plus tax, shipping, and applicable fees; limit 1 per Virtual Ticket). Supplies are limited, so be sure to claim one while you can. Click here to see what’s inside and learn more about how to order. The Virtual Ticket also grants you access to our limited-time online BlizzCon merchandise sale that kicks off before the show. This year’s sale is scheduled to run from October 10 through November 6, and features a selection of commemorative items debuting at the show. ** Stay tuned for more details about what we’re stocking in this year’s store. Even if you don’t purchase a Virtual Ticket, you’ll still be able to catch tons of BlizzCon content online for free. Coverage of the BlizzCon opening ceremony and this year’s BlizzCon esports tournaments—including the global finals for the StarCraft II World Championship Series, Hearthstone World Championship, World of Warcraft Arena World Championship, Heroes of the Storm Fall Championship, and more—will be streamed for free in HD at www.blizzcon.com. To order a Virtual Ticket, head to the Virtual Ticket page . For more information, read the FAQ below. *Diablo III in-game content for PC/Mac version only. To redeem Overwatch in-game content for PlayStation 4 or Xbox One, players must link their Battle.net account to a PlayStation Network® account or Xbox Live® account respectively. For more information on account linking, visit https://eu.battle.net/support/en/article/linking-your-battlenet-account-on-consoles. What is the BlizzCon® 2016 Virtual Ticket? The BlizzCon 2016 Virtual Ticket offers comprehensive live HD coverage of Blizzard Entertainment’s two-day gaming celebration, taking place November 4 and 5, via a multichannel Internet stream. Limited high-definition coverage of the opening ceremony and BlizzCon esports tournaments will be available online for free, including the Global Finals of the 2016 StarCraft® II World Championship Series, World of Warcraft® Arena World Championship, Hearthstone® World Championship, Heroes of the Storm® Fall Championship, and more. Keep an eye on www.blizzcon.com for more information. Note that to redeem the Overwatch in-game content for PlayStation 4 or Xbox One, players must link their Battle.net account to a PlayStation Network® account or Xbox Live® account respectively. For more information on account linking, visit https://us.battle.net/support/en/article/linking-your-battlenet-account-on-consoles. Diablo III in-game content is available on PC and Mac only. This year, Virtual Ticket buyers have the option to purchase one “Goody Bag in a Box”—and just like the name implies, it’s a lot like the usual BlizzCon Goody Bag, only in a box instead of a bag. Once you’ve completed your Virtual Ticket purchase or redeemed your Virtual Ticket code, log in to the Blizzard Gear Store (http://gear.blizzard.com) using the same Battle.net account. Look for the callout on the front page, or click BlizzCon 2016 in the top navigation bar, where you’ll be able to pre-purchase (limit 1 per Virtual Ticket and Battle.net account). Please note that supplies are limited, and buying a Virtual Ticket does *not* guarantee that you’ll be able to also buy a Goody Bag in a Box. Orders will be shipped closer to the start of BlizzCon. For more information, see the Goody Bag in a Box FAQ. 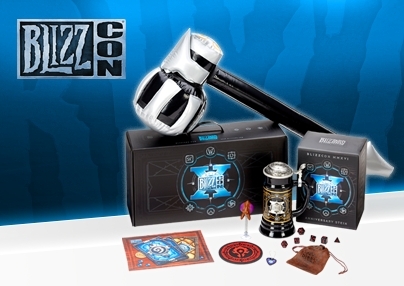 The pre-BlizzCon merchandise for BlizzCon attendees and Virtual Ticket holders is scheduled to begin October 10. You can order the Virtual Ticket directly through the Battle.net Shop. Be sure to make your purchase on the Battle.net account you wish to use to watch the show, receive the in-game goodies, and access the “Goody Bag in a Box” presale and BlizzCon merchandise sale. Also make sure you have a valid, updated payment method associated with your Battle.net account. If you do not yet have a Battle.net account, you can create one for free on the Battle.net website. You can watch the Virtual Ticket streams directly through BlizzCon.com. You’ll also be able to download the free BlizzCon 2016 mobile app (coming soon) and watch Virtual Ticket content there—stay tuned for more information. Live BlizzCon attendees also get a Virtual Ticket with their BlizzCon ticket purchase. BlizzCon ticket purchasers should have already received a code (one per ticket purchased) which can be used to unlock the Virtual Ticket and associated perks on a single Battle.net account. These codes were emailed directly to the BlizzCon ticket purchaser, so check with the person who bought your ticket if you haven’t yet received your code. For those who opt to purchase the BlizzCon 2016 DIRECTV Pay Per View (coming soon), the Virtual Ticket Internet stream will be included with your order. After ordering through DIRECTV, you will receive an email from DIRECTV containing a code that will grant one Battle.net account access to the Virtual Ticket and associated bonuses. You will be able to redeem your code here—just make sure to redeem the code using the Battle.net account on which you wish to receive your in-game goodies.